I woke up this morning feeling tired. I know I don't have a normal 9 to 5 job right now, but I still stay very busy with my new at home life. A load of laundry, an hour of exercise, a few hours of cleaning (yes, every day!! ), a few hours of graphics work . . . and then it's time to make dinner and clean up that mess, water the gardens, and try to do some knitting. It may not sound like much, but when you are a perfectionist like me - you put A LOT of energy into it all. (Cleaning yesterday meant washing the floors on my hands and knees with a ammonia water and a sponge.) The other thing about not having a normal 9 to 5 is that you don't really get a day off. On the weekends, we still need clean clothes and food to eat and I still have to exercise. On top of that, I estimate that I only got about five hours of sleep last night. First, Pea was stressed about work and kept tossing, turning, sighing and grumbling. Then some stupid teen decided it was a good time to ride his loud mo-ped up and down the street. Then, when I finally got to sleep, some stupid pack of teens came walking down the street "talking" at the top of their lungs. So I was really tired this morning. All I felt like doing was sitting on the couch and knitting socks all day. That's when I realized the best part of not doing the normal 9 to 5 thing. I, in fact, COULD sit on the couch and knit socks all day. Pea wasn't going to be home for dinner anyway - he was invited to go out on a boat with some guys from work. And the house was pretty much spotless, so it would be fine without one day of cleaning. Why shouldn't I sit on the couch and knit socks all day?? And that's just what I did!!! Oh yes, at long last, Embossed Leaves are DONE!!! I freaking LOVE these socks!!! Yes, they took me forever to knit. Yes, there are a couple mistakes. But yes, they are mistakes no one could ever see but me . . . and only if I look really hard. I am more proud of these socks than anything I've ever knit, because I when I started them I was sure the pattern would be too hard for me. Now I no longer fear charts, or fancy sock patterns. The best part is, they fit great and feel so comfy on my feet. I love these socks. Now trust me when I say, I really wanted to knit socks today. 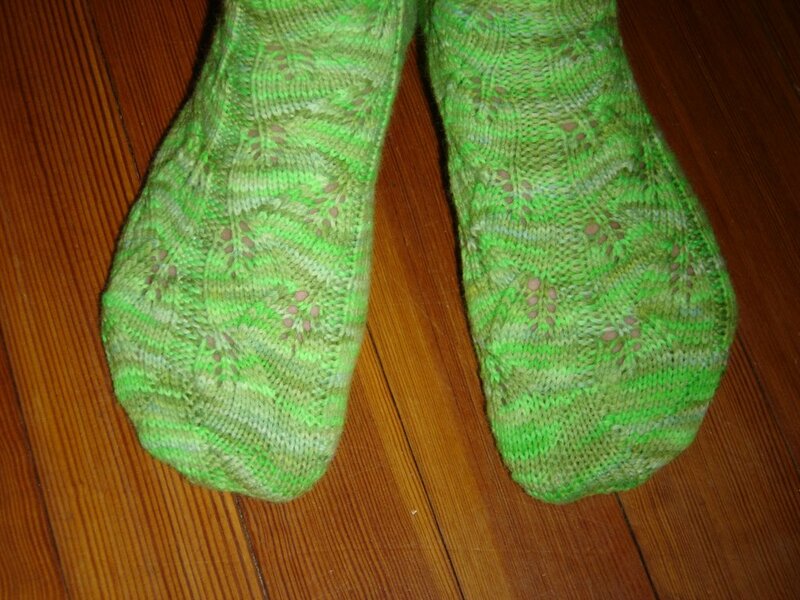 Not only did I (finally) finish Embossed Leaves, but I also worked on my Koigu socks. And wound the yarn for my Mystery Socks and got started on those. And cast on and did a few rows of the Almost Argyle pattern that I had forgotten I bought. What ever happened to my "One Pair at a Time On the Needles" rule?? Hi, my name is Karen, and I'm a . . . . SOCK-A-HOLIC. embossed socks look gorgeous!!! the colour suits them really well! You should be really proud of them! I really hate nights when you cant sleep and you are really tired all the next day. You are so funny. Hi, my name is Kathy and I am a knitaholic too. Good for you! I think knitting all day revives the soul. And your socks are beautiful. Such a pretty color. Congrats on finishing the socks - they are beautiful! While my day wasn't quite as knit productive, since I flew back from TN on the 6:30 AM flight my day was a bit of napping, a bit of knitting, a bit of reading. Good work! Now you really need some more yarn! Love your socks! That's one of my favorite patterns. Ah, Embossed Leaves is such a great pattern! 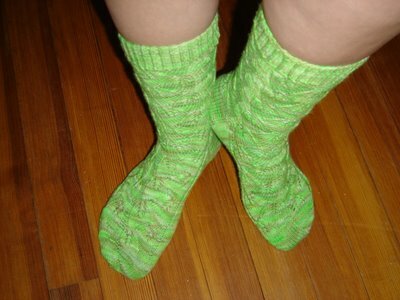 I love yours, they are perfect in that Appletini yarn! Sounds like you got well and truly into the spirit of sitting and knitting socks all day. Yay you! Good for you! Everyone needs a little time off now and again. The embossed leaves are beautiful! Wow! These socks rock big time, and I'm still totally blown away by this color, it's definitely the most gorgeous one I've seen for long! Fantastic pattern, I need to do that one soonest possible too! Congrats on finishing them! They look great! Perfect yarn for the pattern. Embrace your sock-a-holic-ness! You can never have too many handknit socks. They came out awesome! What a great pair of socks!! Outstanding!!! I love the color! What a fun way to spend the day! Good for you! Like I said last week, life is to short to work yourself to death!! I am glad that you took some time to..."smell the roses." Love the color of your socks! It's almost as bright as my Hederas! I felt the exact same way when I finished the Embossed Leaves socks. They look great! The socks are too cute!! And I agree about washing the floor - the ONLY way to get it clean is on your hands and knees. That's the way I was taught. I love those socks, and that colour is awesome!! I was hoping that I had that issue of the magazine, but I only started getting it with the spring 2006 issue. Oh well. They look great! Congrats on finally getting them finished! Yes, you DO deserve some "sitting-on-sofa-knitting-socks" time...........the Embossed Leaves look wonderful!